IntelLiDrives has introduced a new packaged linear motor slide that can be used as a direct replacement for mechanical linear motion systems. 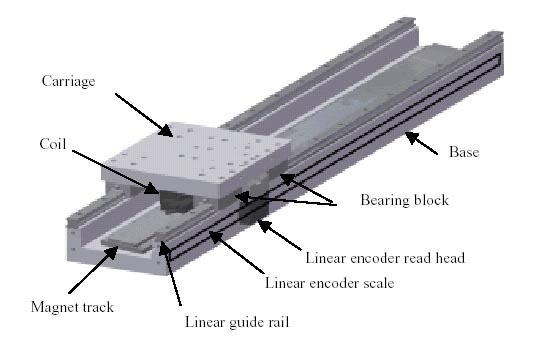 Linear motors have achieved a remarkable penetration into engineering applications previously dominated by ball and roller screws. Understanding that many users of screw technology perceive linear motors to be complicated by comparison, IntelLiDrives has packaged its range of LC-Series brush-less linear motors in easy "ready to use" linear actuator configurations. All that the user has to do is configure a linear actuator package in much the same way as they would to integrate a mechanical screw. Each packaged linear actuator system consists of a linear motor, bearing, encoder and cable management system. The smallest model is an extremely compact unit for its output, measuring just 90mm x 60mm in cross section. As with all linear motors, the linear actuator packages are virtually maintenance free, with no moving parts in contact with each other. The motors offer a high output, with a continuous force range of 80 N -600N, with 250N - 1300N peak, and a high acceleration rate. There is low cogging (0.5% of peak force) and no backlash, with a range of sizes available to suit user requirements. Each linear actuator package is completed with a high quality linear bearing, fitted together with a contact-less linear encoder and proprietary cable management system. The packaged linear motors can be driven using standard IntelLiDrives brush-less servo amplifiers and controllers to provide a completely integrated system.